We were standing in a bookshop in Kilkenney, Ireland, which we were visiting on our honeymoon. I had loaded my kindle up with plenty to read, and even bought a paperback (book one of the A Song of Ice and Fire) to read during the no-electronics portion of the flights. But I was in a bookstore, and you all know what that means. The synopsis of the book struck me as kind of interesting, and I thought it might help me at work. The basic premise is that checklists really can save lives. Not lengthy, twenty-page checklists (i.e., what I prepare before leaving town for two weeks), but five-to-seven item checklists that serve as triggers for the really important things you should do in a given incident. He pulls examples from flight emergencies, financial deals and even surgery. He was asked to help reduce complication rates in surgeries by the WHO, and prepared a three-part, 19-question checklist to be used in high-tech and low-tech hospitals around the world. During the pilot, even the fanciest hospitals saw a highly significant decrease in infection rates, reducing deaths. He repeatedly points out how simple this seems – and how those with high levels of expertise might find checklists insulting, especially when steps seem so basic. But he backs up his assertions with evidence of their success that is pretty convincing. It was a quick read. Even at 200 pages, I pretty much flew through it. 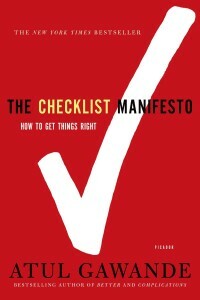 And given my field, I think there are certainly some areas where checklists would be extremely helpful. If you could see potential for improvement in your field as well, I suggest checking it out. My dear friend Herman came into our staff meeting this morning and didn’t look like he was having a good day. I thought maybe it had a bit to do with preparing to host us orphans tomorrow, but Herman doesn’t really stress out about things like that. I was sort of right, and sort of wrong. He wasn’t so much stressed about having us over; he was stressed about not being able to have us over. Let me share the story (it has a happy ending). Herman and Kathleen moved into their apartment over a year ago. They each moved from apartments where their respective landlords paid for the natural gas. When they moved into their current apartment, they were told only that they had to turn on the electric, not the gas. And the gas was on, so they didn’t think to double check that they didn’t have to put the gas in their name or anything like that. Given their past experience – and the fact that the landlord made a point to say it was the electric they needed to turn on (but NOT gas) – this makes sense to me. So National Grid didn’t have their information. They claimed they sent notices over the last year, and maybe that’s true. My guess is the person who lived in the apartment before Herman and Kathleen had his or her mail forwarded, and when he or she saw letters from National Grid threw them out without opening them. National Grid ALSO claimed they sent letters addressed to “occupant.” Doubtful. Herman and Kathleen are two of the most conscientious people I’ve ever met – if they got even one notice, they would have addressed the issue immediately. Want to know how they found out about the issue? National Grid decided to shut off their gas. Seriously. EVEN IF National Grid sent the notices as often as they claim (which I doubt), how can they shut off someone’s gas without any REAL notice? I hold the landlord and the super mostly responsible – the landlord should have told Herman and Kathleen that they were responsible for setting up the gas, and the super could have been a decent person and called Herman and Kathleen and said hey – National Grid is shutting off your gas. But that didn’t happen. Why was this such a big deal? Oh, because National Grid said that they wouldn’t come back to turn it on until December 5. I find this to be an absurdly poor corporate practice. It’s Thanksgiving – it’s not even a religious holiday. It’s one of the three or four holidays damn near EVERYONE in this country celebrates. And, unlike, say New Year’s Eve, it completely and totally involves COOKING. Why would they have a policy of shutting off gas (without giving notice), and of doing it right before a holiday? I just don’t get it. If you must shut it off – do it the day AFTER the holiday. I spent some time on the phone as Kathleen trying to see what could be done to get the gas back on. Nothing. No movement. It was kind of entertaining – I did keep letting the person know that I knew they weren’t responsible, but I also let them know how amazed I was at how poorly this was handled. My apartment is too small to house the ten people, and my oven wouldn’t fit the turkey, so for awhile we were trying to figure out where we could celebrate. Ben and Bonnie did say they could open their home – but they are all the way out in Bushwick, which would have been a tough trek with food from Park Slope / Prospect Heights. But then – someone we know knows someone at National Grid. So Herman called. And that person? Took it on. Was able to talk to someone else who talked to someone else. And guess what? As of 6:30 PM, the gas was back on. Thanksgiving is on. Most everyone could have handled this better. Herman and Kathleen probably should have double checked on the gas when they moved in – but given their history, why would they? I’ve never had to pay for garbage collection, so it wouldn’t occur to me to make sure I was paying that bill or that it was in my name. The landlord DEFINITELY should have told Herman and Kathleen that they needed to set up the gas in their name. That’s really the only way they would find that information out. And the Super should have given Herman and Kathleen a heads up that the gas was being turned off – the Super is well aware that people are living in that unit, and he’s even met them. Is it his responsibility legally? No. But as a compassionate person I would say yeah, he should have done something. And finally, National Grid. You REALLY should re-evaluate your policy about shutting off gas. Waiting OVER A YEAR and THEN turning it off the day before Thanksgiving, and not having anyone available to turn the gas back on in case (as in this situation), it should not have been turned off in the first place? SO NOT COOL. In the grand scheme of things – tonight as I type this I’m watching the horror going on in Mumbai – this is not a big deal. Not even a small deal. But it was a completely unnecessary stress, and I think we could all do without those this time of year.